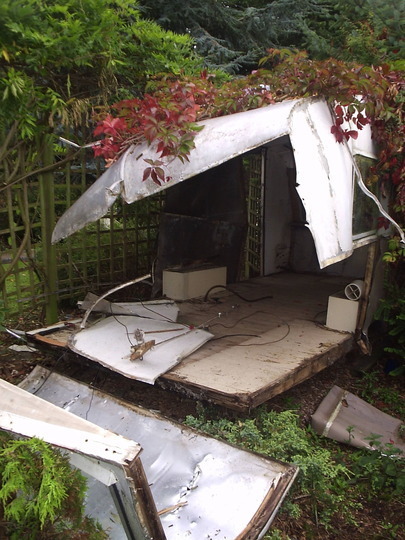 One of the biggest tasks at The Haven last year was the breaking up, and disposal of, a derelict 1960s caravan, hidden under a massive Wisteria. This happened towards the end of last summer, exposing an area of garden which, mainly on account of the Wisteria, and some nearby Pieris, Rhododendrons and Azaleas, I thought, should become the “Hint of the Orient” garden. This area came to light, and I was all set to build a formal lily pool within the 8′×4′ area inside the slabs, when the snows came, and everything came to a sudden halt. 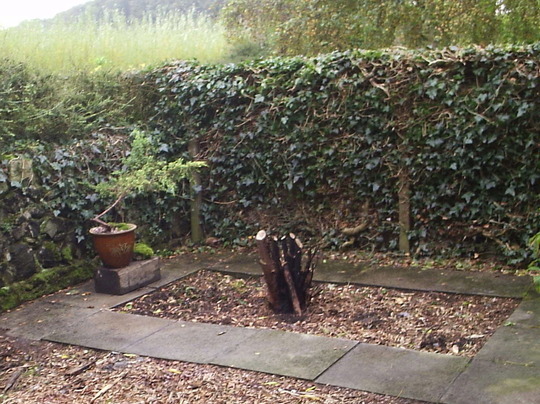 Last week, I got the Leylandii stump out, and started to excavate the area inside the slabs. Luckily for me, “Le Chef”, Squire’s and M’lady’s son, came home for a visit, and was given the task of digging the hole! At just over 2 feet down, he unearthed a long-lost pet, who has been “re-located”! 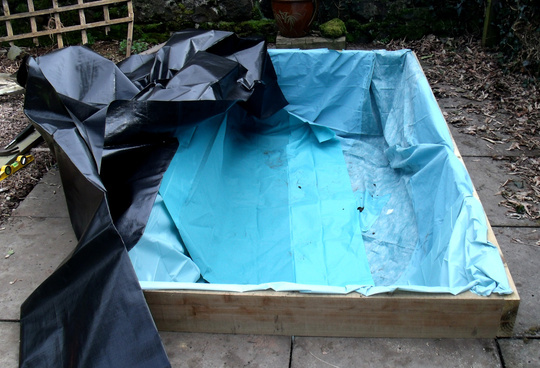 Yesterday’s “mission”, was to, finally, build that lily pool! Over the past week, M’lady and I had had a few discussions re the pool. I wanted it to be 1 foot below ground level, and 1 foot above. Having seen the hole, she wanted it to be level with the slabs. I pointed out that the area does attract some debris (witness, the old Autumn leaves in the above pic), and some barrier to this would be better than none. 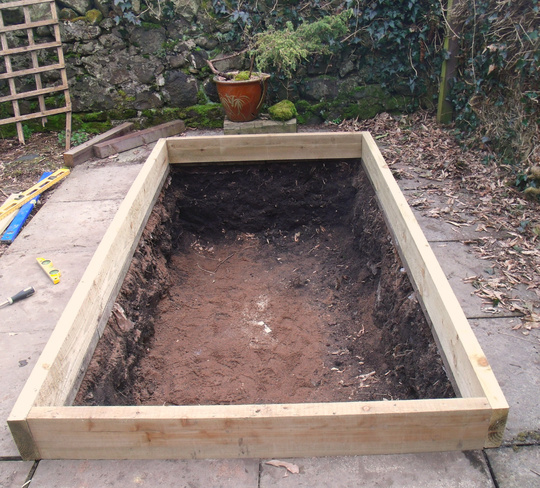 In the end, we agreed on the 2ft subterranean depth dug to by Le Chef, and 6" above ground level, as below. I put together the frame, then stapled a barrier membrane and, then, pondliner, to the top edge of the frame. For the protective “fleece”, I used fluid-proof surgical drapes, from work, lol!! We often get sizes wholly unsuitable for us, and keep them aside, as we all use them as dustsheets for painting and decorating, at home. There is no outdoor tap at the Haven and the hose, led round the house from the kitchen, was still a good 10ft short of the pool. With the jet on maximum power, and Squire’s ingenious use of props, a suitable “hands-free” system was put into place………. 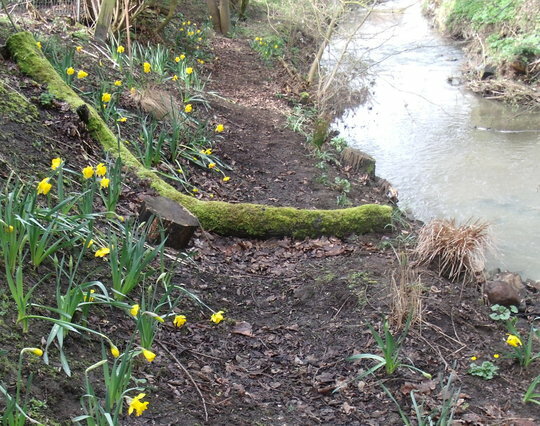 This left me free for a few hours, so I did some weeding along the stream enbankment, where the ground elder is beginning to reappear. 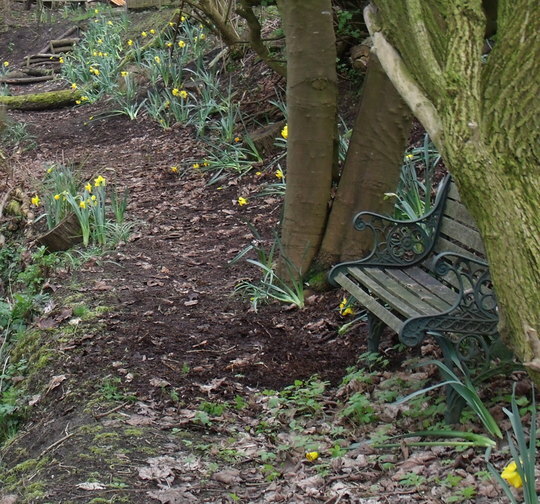 I had my afternoon cuppa sitting on the bench here, admiring the narcissi, which were planted along here last Autumn. 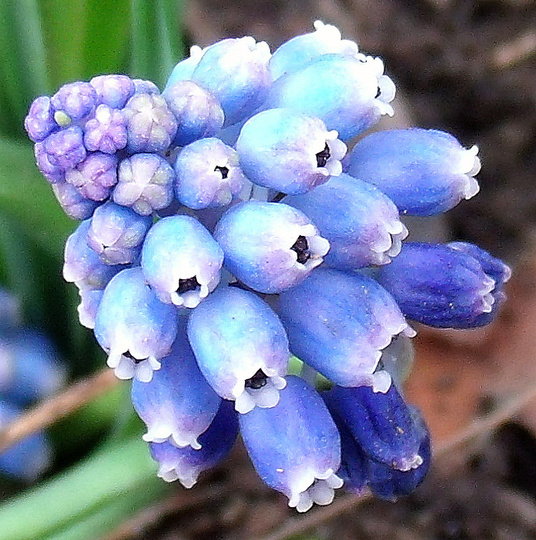 At the beginning of this week, GOYer Shirley Tulip sent me a box of Grape Hyacinth bulbs (I’m all for anything invasive here of a nice kind) and these, along with some more snowdrops and Winter Aconites from Amy, were planted along the enbankment. 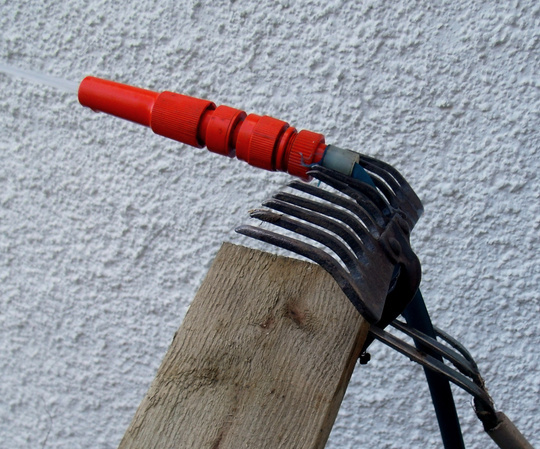 Squire and M’lady, who had gone out to look for a water feature for the pool, returned empty-handed – well, almost. They brought back these, for a laugh. 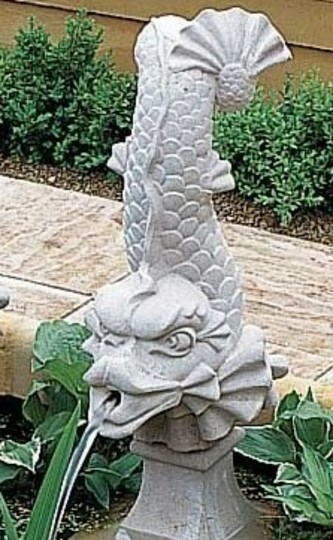 They have, however, decided on this water feature which, I suppose, does look a bit oriental, but it will be 4 weeks or so before it is delivered. 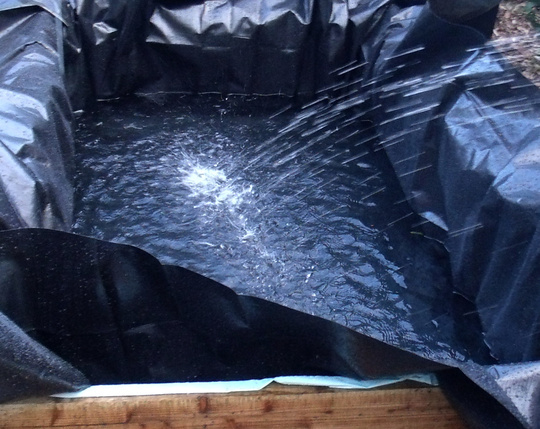 After more than 4 hours, the pool was finally filled with water, and I was able to trim the liner, stple it to the top edge of the frame, and finish off with a wooden rim. In true “Groundforce” style, Squire produced a bottle of champagne and, just as it was begiinning to get dark, and with rain starting to fall, we toasted the pool and launched the ducks and lilies, lol! Previous post: Snowdrops at the "Haven"
Wow impressive - love the water feature. Well done David, what a feat. I found that very interesting. Love the finished pond/lake. Love it well done all of you. A great job well done, and isn`t it great when someone else gets to do the digging. lovely blog ~ looks like one of those programs that do a make over in 2 hours!! 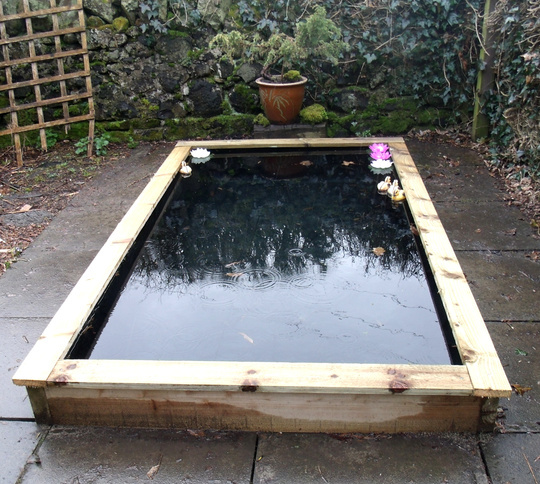 have you used wood just above ground level around the pond? i still like that lovely shaped tree in the pot at the end of the pool ~ looks very japanese to me. perhaps the rake should have been made into a permanent garden sculpture!!?? must have been a good drink ~ cheers!! excellent job there, it looks great. i couldnt find any this year either cristina ~ got a lovely one last year but none this year. Again, Many thanks, folks. 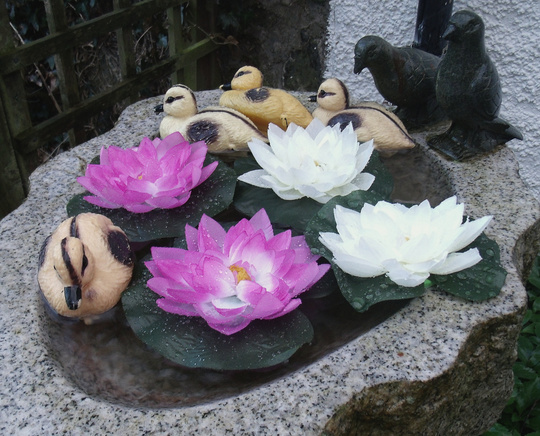 have nick-named the ducks "M'lards", as seems to fit in with M'lady, squire and Le chef. 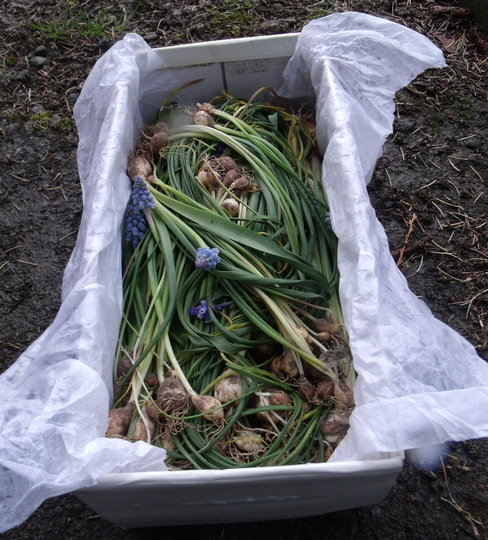 Not usually found here at this time of year, "in the green", but more usually, the tubers are sold ready for Autumn planting. Even some of the "poundshops" around here sell bags of them. Will be looking out late summer for these. Perhaps you will have better luck, then, Cristina and Sticki? A lot of hard work but well worth it, it's "Looking good"! A great job well done, David! :-)) The pond looks really nice! Can't wait to see it full of water lilies! aconites in pound shops or did you mean those ducks? Thanks, Balcony. There doesn't seem to be any lilies, or much else, available here, yet. Oh the satisfaction of a job well done! Congrats, David. 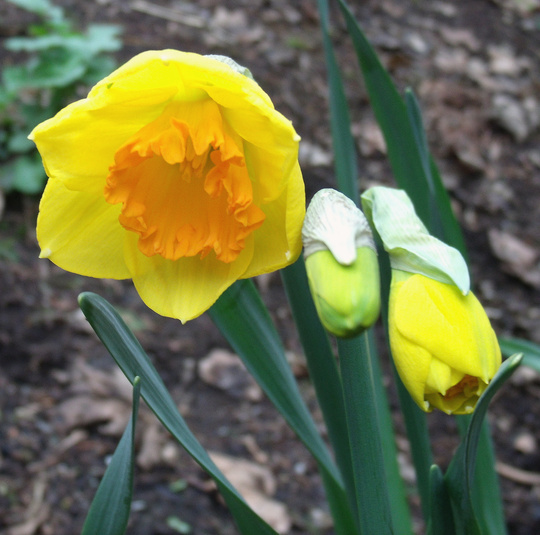 Great to see the banks with all the bulbs up and blooming! That area looks wonderful and the new pond is a tour de force! I'm glad M'lady agreed to the "lip" on the pond...will you be staining the wood, leaving it to "gray", or adding some ceramic cladding? Will there be fish, eventually? 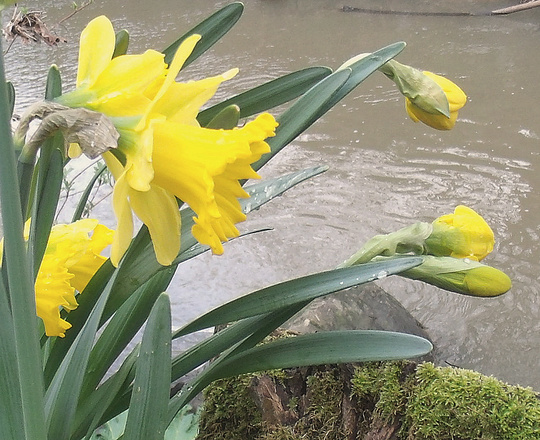 Water circulation isn't usually necessary just for lilies, in fact, some lilies don't care for too much water movement. (something to check out when ordering stock.) Quack Quack!! I'm looking into the process of constructing a Duck/Goose Pond!!! Guess you're busy "keeping your ducks in a row"..hee hee... sorry couldn't resist. Am going to have to exercise great control when choosing the plants, lori, I know. The wood will be stained a colour, but have to construct an adjacent decking area, so will leave until this is done. I wonder what colour Squire and M'lady will choose???????????? 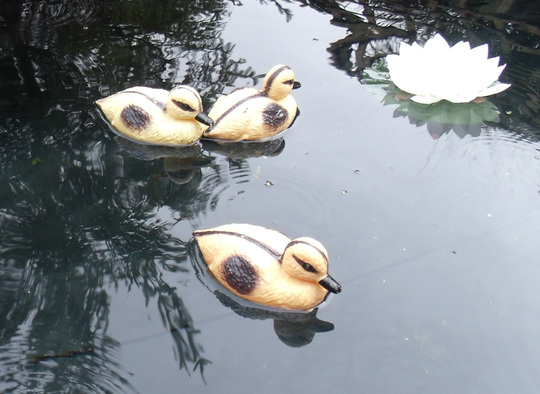 Hope that you get your pond for the ducks and geese!